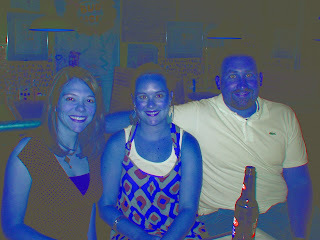 First off, let me say I have no idea why these pictures turned out blue. I will try to fix this problem, maybe. 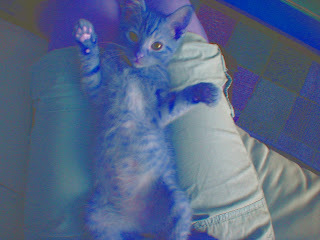 I realize this blue tint takes away from the luscious look of the cake and the cuteness factor of my kitten. I guess I will just have to deal with this. 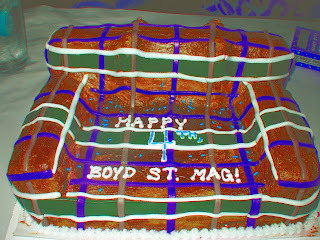 So Boyd Street had its 4th birthday last week. This was the cake, and it was awesome. Any of you who need a cake decorated for an event, call Alyson Stearns-Bell. She is amazing. Here I am with Emily and John (owners of the mag). Sweet earrings (if you can see them). And this is an updated picture of my sweet kitten, Marigold. Awwwwww ......... (except for that blue haze). Not too much new. C took his first round of generals. Awesome. I'm working at the mag and nursing a bad mood. Not so awesome. We're going to the intelligent design v. evolution lecture tonight. Should be awesome. Incriminating stories are my favorite stories. I didn't sleep well last night and at 12:30 got so frustrated I kicked Collin and woke him up and all but shouted, "Don't wake me up until 7:30. I can't sleep." I also mentioned something about his legs twitching in his sleep, but he knows I wasn't blaming him for keeping me up. What he really knows is that I am quick to lose self control and am very hateful when I can't sleep. So what does he do? He gets up this morning and gets my breakfast stuff ready and puts together my lunch and washes the dishes I didn't get to last night. He says he did this bitterly whilst trying to love me. I say it doesn't matter. I appreciated it, period.